Florida led me back to painting. to return to painting after having put down my brush in late 1971. Cleofar Millare made Valkaria Gardens a reality. B. Frank Brown Ed. 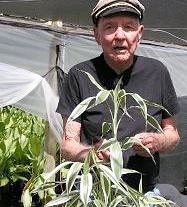 D.
retired Brevard County school superintendent, traveled the world with US government license to bring back exotic plants. Valkaria Gardens, Palm Bay, Florida, began in 1988 as Dr. B. Frank Brown’s dream to educate the world and share his passion for rare, unusual, blooming and colorful foliage plants. 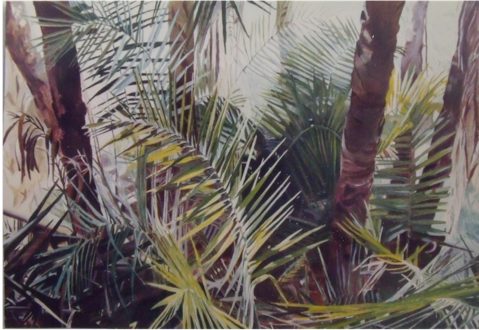 After two years of laborious work the gardens were realized as a lush tropical oasis of palms, bamboos, fruit trees, bromeliads, flowering landscape plants, and many hard to find, unusual tropical specimens. I hope my paintings are helping to keep Dr. Brown’s dream alive today. Click here to see Valkaria Gardens today. Valkaria Gardens remains my chief inspiration and favorite garden.